Miniature roses are perfectly scaled, smaller versions of larger roses, with all the colors, forms, substance, and often, fragrance of full-sized roses. Like other types of roses, each variety of miniature rose has different characteristics, with plant size ranging between 6 inches and 4 feet or more and plant shapes that include bushy, compact, climbing, and cascading. But no matter what the shape or growth habit, a good miniature rose has flowers and leaves in perfect proportion. Smaller definitely doesn’t mean less attractive, and in most cases, smaller does mean easier to grow. Their smaller habit makes miniatures ideal for growing in containers. The flowers provide bright and constant spots of color throughout the growing season, and you can cut their flowers for mini-bouquets and arrangements. The selection of varieties is awesome, and hundreds of new ones are introduced each year. Miniatures are wonderful landscape plants. Because the plants are so small when you buy them, it seems as if they’ll take forever to grow and put on a good show. But don’t let that small size fool you. Miniature roses reach full size quickly, and they flower big-time all season long. Miniatures make beautiful up-front plants. Use them to edge a flower border or walkway, or plant them at the base of taller-growing plants. Miniature roses are actually pretty tough plants. They’re almost always propagated and grown on their own roots, which gives them greater hardiness in cold weather than many other types of roses. Like most plants, however, they’re not real thrilled with harsh winter winds and the nasty freeze-and-thaw cycles that some winters bring. 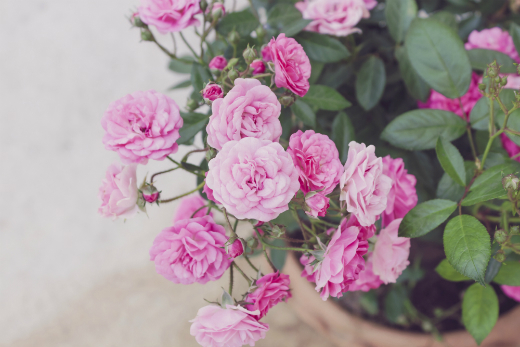 Even though your miniature roses will most likely live and do fine the next season no matter what you do or don’t do, if you live where temperatures regularly fall below 10°F (–12°C), they’ll suffer less damage and thrive more readily if you mulch the base of the plant with leaves for winter protection. Smaller plants mean smaller roots, and smaller roots don’t grow very deep in the soil. So, if Mother Nature doesn’t provide rain, your mini-rose needs more frequent watering. Also, smaller plants require smaller doses of fertilizer. Generally, plan to fertilize a third as much, twice as often. As with full-sized roses, deadheading is pretty much all the pruning you need to do during the growing season. You don’t need to cut back minis in the fall, and in spring you need only prune away the dead parts. If you have lots of minis to prune, a hedge trimmer does a great job. Shear plants back about halfway, meaning that a 12-inch-high plant should be about 6 inches tall after pruning. For fewer — but bigger — flowers, you can prune minis just as you would hybrid teas. Don’t believe people who try to convince you that growing miniature roses indoors on a windowsill is easy. A miniature may stay in bloom for a week or two inside, but eventually the plant needs to go outside where light is sufficient and conditions are better for healthy growth. Those who do have success growing miniatures indoors usually have a greenhouse or provide some type of supplemental lighting.